Kitchen Workstation Furniture to the Rescue! Builders! Homeowners! You may need to sell your homes in a saturated or over-built market in the future. You’ll need some fresh ideas that can help you rise above the competition, ones that can create a media buzz to drive buyers to you. When you are planning to sell a home in the future, you are going to have a lot of competition. Many builders try to attract buyers for their pre-sold and inventory products by reducing prices, offering upgrade incentives or paying all the closing costs on below market loans. Homeowners accept lower bids and/or get caught playing the buyer’s game of demanding last minute concessions (like providing all new paint or carpeting) just before closing. It is important to differentiate what you are selling from the competition. Rather than, or in addition to playing the price game, distinctive design can be the very best strategy. A prospective buyer becomes a buyer when a home’s value is perceived to be superior to the competition. And good, innovative, even unique design can be the best way to enhance the value of the home. By substituting Kitchen Workstation Furniture (KWF) instead of cabinetry, a completely different look can be accomplished that can bring instant recognition for your home. It is a gutsy move. After all, a furnished kitchen is admittedly an unnatural act. 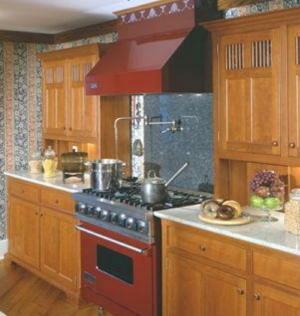 For our entire lives, most of us have only been exposed to built-in, cabinetry filled kitchens. But once prospective buyers see what a furnished kitchen can do, they will see you as an innovator, and they’ll be quite pleased with themselves for having found you. In effect they have determined that the value of your offering is worth it, and you may not need to offer other price reduction incentives. What are Kitchen Workstations? Simply stated, workstations are separate pieces of furniture that incorporate specific kitchen functions. A typical furnished kitchen is composed of 3 to 5 pieces of extremely functional ‘freestanding’ (completely finished on at least 3 sides) pieces of appliance concealing furniture instead of endless lines of built-in cabinetry, counter tops and exposed appliances. Many cabinet manufacturers and a few furniture companies offer workstations of all shapes and sizes, some that can conceal refrigerators and dishwashers. YesterTec is the only company in the world that offers patented, U.L Listed workstations that can conceal all the other ‘hot’ appliances such as ovens and cooktops as well. See below for a more detailed description of YesterTec’s unique workstations. The best way for a builder to present Kitchen Workstation Furniture is in a model home setting and of course for homeowners, your home is the model home! Displaying a completely decorated kitchen will allow the potential buyer to see what can be done with the spaces that are between each separate piece of furniture. The spaces are the key to the whole concept. Just like all the other rooms of the house, the spaces allow the wall, ceiling and floor surfaces to flow between the independent pieces of furniture. The spaces can be architectural features such as windows, doors or a fireplace. Or the spaces can be areas filled with items that bring personality into the room such as artwork, shelving displaying collections, or even other pieces of furniture such as a breakfast table or desk. The following ideas highlight a few home types that could benefit from this exciting concept. Make it simple, create a beautiful room, then furnish it! Bring the décor of the family room right into the kitchen. The kitchen/family room has become the HUB of family life, so make it look more like a living room than a laboratory or commercial kitchen. Eliminate the soffits and wing walls and turn that tiny window over the sink into a full-height window or door feature. Keep the cook involved in the family’s activities and hide the countertop mess at the same time by placing an island workstation with a raised back/storage partition between the kitchen area and the family room. This home design concept as promoted by architect Sarah Susanka, (visit http://www.notsobighouse.com/) features multifunctional spaces that eliminate the need for single task rooms. Saving square footage can allow for richer finishes and features throughout the home. Quality over quantity is a perfect mantra for Workstation design as well. Just a few pieces can create an entire kitchen. Concealing appliances inside the furniture when they are not being used allows the kitchen to become part of the less technical looking living areas that are used throughout the day. In most cases, the dedicated formal living room, dining room and even the foyer can be eliminated in lieu of this multi-functional space because the workstations can have a formal look (with the appliances concealed) and an informal look when they are being used. Many Baby-Boomers are giving up their large home in the suburbs and moving to smaller homes, condos and Active Adult communities. But they are slow to give up the bells and whistles that they have ‘earned’. Again, the innovative features of highly efficient, heirloom quality workstations can appeal to this market. 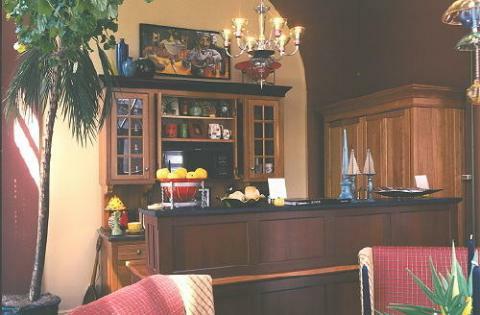 And the homeowner’s furnishings that have been collected over the years blend much better with kitchen furniture than with the typical monochromatic cabinetry found in typical model homes. New Starter Home market: One specially designed workstation can make all the difference in setting one home apart from another. Starter homes can have complete but very simple 3 piece kitchens, or partial kitchens with only one accent piece as upgrades to standard kitchen design. Then they can increase their collection of workstations when their financial position increases. They can even take their collection with them to their next home! 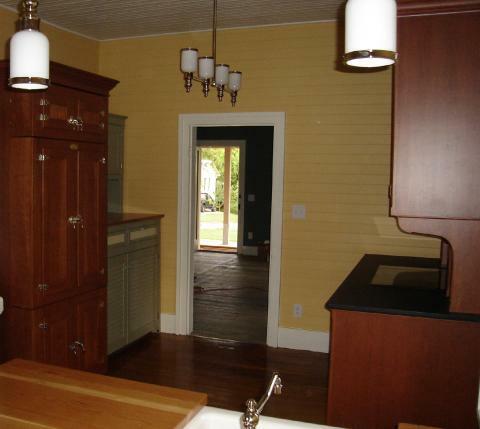 Pre-WWI homes typically had ‘kitchen-only’ kitchens. They were not planned for socialization. There were usually many large windows that were needed for light and ventilation, and many doors led to all the other segmented rooms. Furniture is great for these broken-up kitchens because the individual pieces can fit into the smaller wall spaces that are available. The tall, vertically oriented, full-height workstations maintain the proportional balance of the room’s typically high ceiling. Or using only one or two tall pieces combined with more base and island pieces creates the proper scale for a room with lower ceilings. Kitchens in post WWI through the early 1960’s were often eat-in kitchens but separated from the other more social rooms. Knocking down a wall may be required to create a live-in kitchen that will be more compatible with today’s lifestyle. In the 60’s and 70’s, the family room invaded the kitchen, but these kitchens may be over-due for renovating. 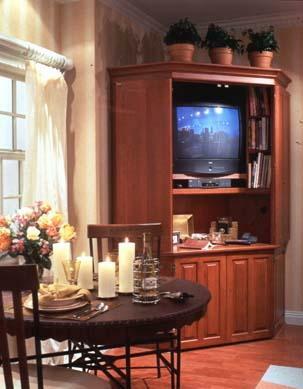 All can benefit from the ability of furniture to blend into the design of adjacent rooms. In many cases, adding only one key piece may be all that is required to give your kitchen a lift. Replacing a tired island with a Worktable (an open piece featuring 4 legs with or without a sink or cooktop) may provide a great transition to the adjacent room. Or by adding a Working Pantry, an armoire that conceals small appliances, a countertop and lots of storage, you can create a place that can be used as a baking center, a snack center or a freestanding butler’s pantry. 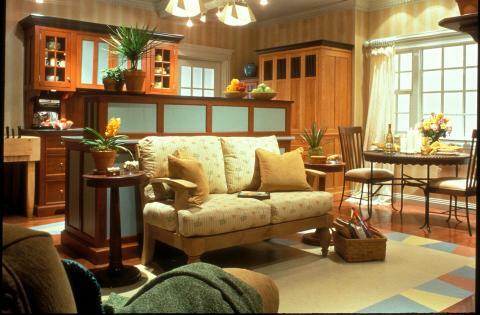 Open planning, banks of tall windows, high ceilings, continuous wall, floor and ceiling materials all define loft spaces. A kitchen designed with workstations preserves the integrity of the space and can blend intimately with other room functions. 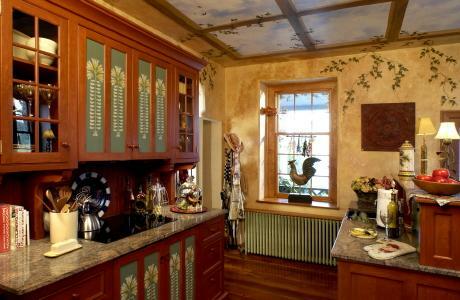 Few blank walls are required for a complete kitchen, leaving the tall windows intact. Tired of offering the smallest of all living environments with the kitchen always in full view? 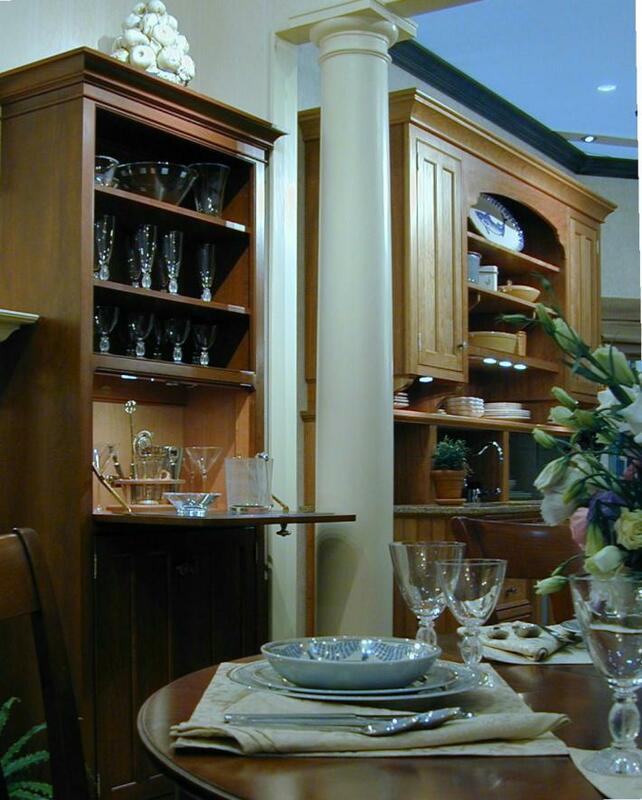 YesterTec makes the Armoire Kitchen that is a complete mini-kitchen in a 72″ x 25″ area. Designed for 120V power, it can be retrofitted into small living spaces for America’s prime real estate markets where space is a premium. None of the appliances, sink or countertop is exposed when it is not in use, making it perfect for this multifunctional room. No wing walls, soffit or ‘illegal’ closet is needed to hide a standard kitchen. Another model, the 96″ long Master Kitchen features more refrigeration capacity than the Armoire Kitchen but otherwise it is the same. No need to compromise here because YesterTec’s U.L. Listed workstations that conceal the hot appliances like ovens and cooktops virtually eliminate the modern look of appliances without eliminating their sought after conveniences. If you are already planning to conceal the refrigerator and dishwasher with wood panels, now you can conceal all the other appliances for a more authentic look. Don’t want to hide the appliances? Use the retro-look appliances that evoke the style of early wood or coal stoves, or early electric refrigerators or even iceboxes. These appliances were originally designed to be freestanding, so they definitely qualify as workstations. 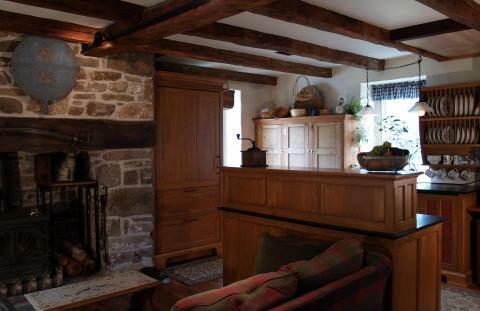 Then you can use a selection of cupboards, armoires, worktables or island pieces to complete the kitchen, just as it was done near the turn of the twentieth century. Finally, you can present an alternative to the stainless steel ‘trend’ by concealing less expensive appliances. But if you can’t give up on the ‘must have’ commercial-look stainless steel range, make it a focal point by centering it between two beautiful freestanding cupboards and bringing the entire ensemble back into the world of furniture. The Master Suite: Today’s largest homes have homes within a home. They’re called master suites and they contain spa-like bathrooms, dressing rooms, sitting rooms, exercise rooms, balconies or private courtyards and oh yes, a bedroom. Typically, they are so far away from the kitchen that they ‘need’ one of their own. 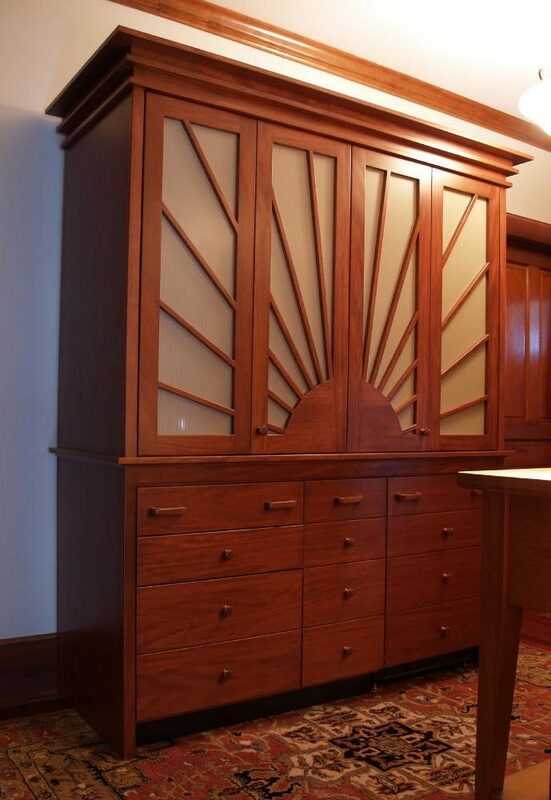 Use a hospitality armoire that accommodates a fully appointed wet bar or a simple snack center or even one of YesterTec’s complete Armoire Kitchens. Transform one or two of the extra bedrooms or the attic or unfinished basement into a well appointed Second Master Bedroom, Guest or In-Law Suite. Family demographics are dramatically changing, and the single family home is increasingly being inhabited by non-tradition family groups. The Second Suite can be as simple as the Urban Studio, or as elaborate as the Master Suite as described above. Perhaps you can eliminate a dedicated room by bringing the office right into the kitchen. YesterTec makes desks that can combine kitchen functions with standard or electronic office requirements. Use the breakfast table as additional work space in a multi-task space. 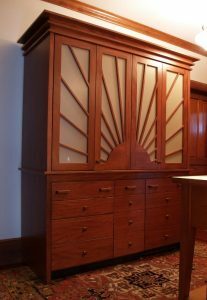 For separate home office rooms, you can offer a separate armoire that can combine a concealed snack center with office storage requirements. Both of these furniture pieces blended with sofas and reading chairs can create a cozy, well-appointed working environment. Green design: By combining rooms together, workstations can actually save space because the kitchen can blend so well into any other space. Kitchens can become beautiful, multi-task rooms, eliminating the need for lesser-used rooms like living rooms and dining rooms. Saving space saves money in labor and materials, and saving materials is the best ‘green’ design technique of all. Simple installation: By selecting real pieces of furniture, many operations that are typically completed on site are completed in the factory. So installation is simplified. Furniture can arrive in large completely finished pieces, not an assortment of boxes that need to be joined together. No cutting, sanding, fitting, hanging doors or onsite finishing is required. Even stone tops can arrive completely finished too! Just move them in, level them, fasten them to the wall or floor, set the appliances, sink and connect the utilities. Builders, put your model’s workstations on wheels, even the tall ones! You can actually offer a few different kitchen arrangements, and MOVE the pieces to show your customers the different arrangements. Maybe someone wants more or less space between the islands. SHOW IT TO THEM! Or perhaps you just want to refresh your model design. You can just re-arrange one or two pieces. Call your local paper, life-style magazine or cable news show. Editorial endorsement is always valuable (and much, much cheaper) than advertising! You are an innovator, you are doing something different and the media will respond! KWF can reinforce your game plan to maintain higher standards than your competitors. This revolutionary concept gets people talking, and they’ll be talking about your property, not your competitors’. Sell it; don’t just sit on it! KWF is unique, exciting and full of buyer appeal. The sculptural appearance of KWF is recognized as a high quality upgrade for any home. For example: A YesterTec kitchen in a north shore Long Island Over 55 condo ‘sold’ the unit when the owners moved to Florida. Many other lesser-priced units were for sale at the same time! In a buyer’s market, you may need some unconventional ideas to separate you from the pack. By using Kitchen Workstation Furniture, in one of it’s many applications, you’ve provided cutting edge design in a time-tested venue (furniture) while satisfying your buyer’s need to substantiate the value of your property. Your potential buyer will thank you. By becoming a buyer! Next ArticleArmoire Mini-Kitchens are Incredibly Innovative!